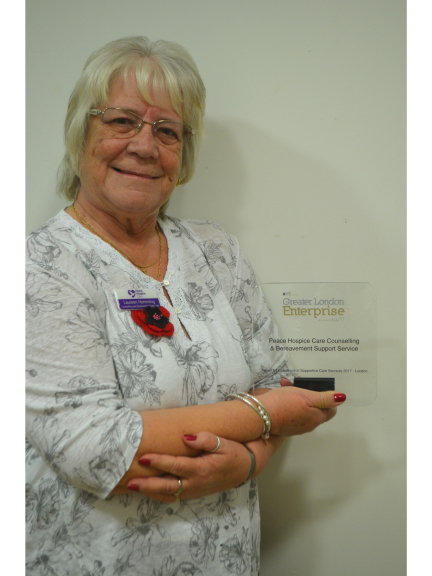 Peace Hospice Care’s Counselling and Bereavement Service has been awarded the SME News Greater London Enterprise Award for Excellence in Supportive Care Services 2017. The award recognises ingenuity, hard work and outstanding performance. Last financial year, Peace Hospice Care’s Counselling and Bereavement Service delivered 1,716 one-to-one sessions to individuals from across South West Hertfordshire. The service supports patients, their families and carers – from diagnosis of the illness and through bereavement too. Support includes one-to-one counselling for anxiety, depression and loss, an in-house bereavement group and a club for those who have lost a partner.